Established in 1955, Supersprint® is a traditional family business with already over 55 years of experience; developing and handcrafting some of the best sport car performance exhausts in the world. Thanks to its experience and strong long term association with several car manufacturers’ factory racing teams, Supersprint designs, develops and produces real performance systems from scratch. Placing emphasis on testing, by making use of their very own in-house MAHA 4x4 dynamometer, Supersprint ensure they continue delivering real performance from high quality exhaust systems. Supersprint autonomously design, develop and manufacture complete exhaust systems for a wide range of cars, e.g. from the small 4 cylinder Fiat 500 to the 12 cylinder Ferrari Scaglietti. With a particular interest in sport cars such as BMW with M engines, Mercedes with AMG engines, Mitsubishi Evo, Subaru Impreza and super cars like Porsche and many others. Looking at a Supersprint exhaust system you can see the attention to detail, the quality materials, precise welds, rather than crimped seams, and the superb finish all reflecting the pride of the entire organization. And you can truly see, feel and hear the quality, now and for years to come! Established in 1955, Supersprint develops and handcrafts performance systems drawing from it many years of experience. All of the Supersprint exhausts are specifically suited to each specific car model, and guarantee an ideal blend of performance increase, reduction in exhaust back pressure, sport sound and legendary durability. Supersprint individually tests each of their components, from racing-design headers to through the exclusive, high flow-metallic catalytic converters to the rear mufflers, in order to ensure a perfect compatibility and an optimum function in conjunction with the OEM exhaust parts. 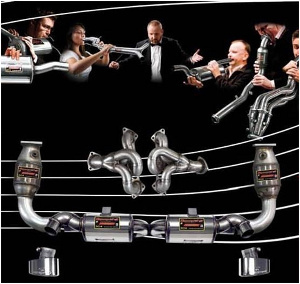 Supersprint proprietary international patents on some of its exclusive headers’/manifolds’ design, as well as on some silencer designs, had not yet been surpassed by any other manufacturer. Supersprint has over 100 different shapes and sizes of tail pipes styles, interestingly holding international patents for over than 20 of these specially designed exhaust tips. All of the Supersprint exhausts are specifically suited to each specific car model, and guarantee an ideal blend of performance increase, reduction in exhaust back pressure, sport sound and legendary durability. In addition, Supersprint develops and also sells free-flow only exhausts, each suited to the car’s particular engine type. The dimensions of the pipes and the inner silencer cores’ are carefully determined in each application for the best results. For weekend sport driving sessions at the race track or the occasional club race, catalytic converter replacing silencers and tubes are available for even more performance. These systems carry all gas metering devices just as OEM parts do and can be combined with straight central pipes (no silencers) for race car sound and performance. The Supersprint race systems with “oversize pipes” are recommended exclusively for use on race cars, or street cars equipped with heavily modified engines (larger engine displacement, extreme cam timing, turbo conversions, and more). These systems are not legal for street use, but can be easily replaced with original parts for everyday driving. Supersprint recommends the use of complete exhaust systems (header, centre & rear muffler) to achieve the highest performance gains. Supersprint guarantees that all of its exhausts use premium quality stainless steel, offering a flawless fit and giving a sporty, yet not offensively loud, sound note. The authentic “TÜV approval” found on our road legal systems guarantee meeting sound emissions restrictions worldwide.